This military surplus ammunition has hard military primers and may FTF (fail to fire) in some commercial guns. Also, the rounds have been stored in unknown conditions and some may have slight corrosion evident on the casing. The government sells its ammunition as surplus for any number of reasons, whether it has discontinued use of the weapon that fires it, too much of it was made, or it has just sat around a little too long. Shooting enthusiasts value it because it was manufactured according to very strict standards -- few things are more inconvenient to soldiers than when their weapons fail to fire in battle. 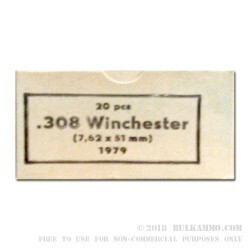 This 308 Win cartridge was made by Sellier and Bellot, so you can trust the this European mainstay's reputation for excellence when you purchase it. It features a 147 grain bullet with a full metal jacket, so you’ll save your bore and your accuracy while firing it. Its brass casing sports a Berdan primer, so reloading it won’t be quite as easy a task. On that note, these rounds have hard military primers. That means they’re less prone to an accidental slam fire (another great inconvenience for soldiers), but at the trade-off of sometimes failing to fire in some commercially available firearms. Still, at this price, you’ll agree that these 500 rounds are very much worth it!